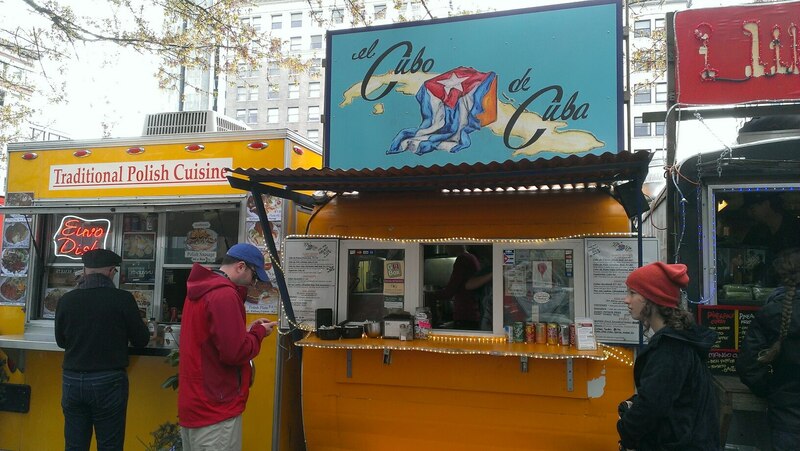 Portland is known for their thriving food cart scene. Every so often we like to take a trip downtown for lunch…it’s always a tough choice! Do we go with a tried-and-true favorite, or take a chance on something new? 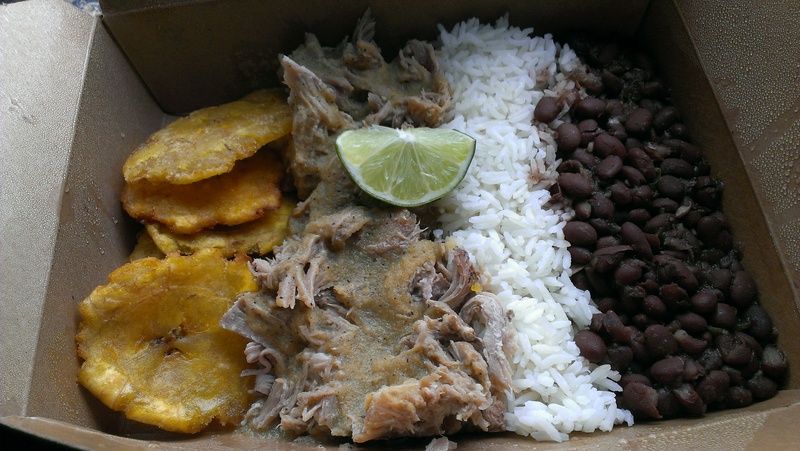 I decided to try this Cuban cart and ordered the “Pork box lunch.” This included pulled pork, white rice, black beans, and a choice of sides. I went with the fried green plantains with a dusting of salt. Lunch was fantastic! Afterwards we ended up at Music Millennium, a cavernous record store that sells new and used CDs, records, DVDs, and Blu-Rays. One of our favorite pastimes is scouring through record bins for treasures to add to our collection. We spent about an hour there and emerged with some great finds. Spent too much money as usual, but it’s hard to show restraint! All in all, a wonderful Saturday. Sounds and looks like you and Tara had an awesome time in Portland this weekend, Mark! And hey, I LOOOOOOVE Cuban food. One of my Florida friends was Cuban and he would cook the most amazing meals for his girlfriend and I, some nights. Delicious! I love F.Y.E. for that same reason. In fact, I just bought some new DVD’s this week! Mmm. Now I’m having a craving for tostones too! YES! That’s what they were called: tostones. And they were pretty stinkin’ good, too! You’ve totally made me hungry for my favorite cuban food: steak palomillo (your next commenter not such a fan of same… to each his own & more for me), with the sauteed onions and lime drizzled over to enhance the flavor (it should have some flavor if (a) a good cut and (b) well prepared, but it will be uber thin), with white rice (no black beans for me, thanks … to each his own & more for you), and both plantanos maduros (fried sweet plaintains) and tostones (twice-fried green plantains) if available. YUM! In Miami it is impossible not to become a convert to Cuban food which is very good as opposed to Cuban elected officials which are very bad and crooked and Cuban policeman are notoriously trigger happy when confronting young black male suspects. I see the lime which is mandatory. Just about all Cuban food is good, except a steak. It is a thin cut t-bone , pan fried and tough and tasteless. Never get a steak. Dog vomit is better. I stand by my criticisms of politicians and cops. Every week there are a few questionable activities reported in The Miami Herald and indictments are as prolific as Everglades mosquitoes. Note to self: avoid Cuban steak. Note #2 to self: avoid corrupt Cuban politicians and cops. Note #3 to self: when traveling to the Everglades, stock up on mosquito repellent. I’m so bummed right now that we didn’t try any food cart vendors while we were there. I see Anthony Bourdain hit them up a bunch on his show so now when we travel, I may be looking for some good food carts to try! Portland’s food cart scene is rockin’, Jess! There are pods everywhere, and you can get pretty much anything. Tara ordered dumplings from a Georgian (as in the country in Russia) cart. You can basically walk around this pod on 10th and Alder and travel the globe.